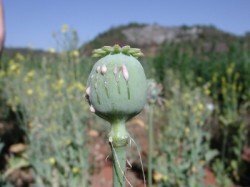 Opium is a highly addictive substance that is derived from the poppy plant and often used as the foundation for various other drugs known as opiates. Opiate addiction can lead to physical withdrawal symptoms and often requires professional help in order to get well. The physical and psychological dependence that can develop from the use of opium or its derivatives which include heroin, morphine and Oxycontin are potentially fatal when left untreated. Opium withdrawal is one of the most common reasons why those who are addicted stay hooked on the drug. The withdrawal symptoms that commence when opiates are no longer being used after a physical dependence has developed include nausea, vomiting, diarrhea, chills and flu-like symptoms that are difficult for the user to cope with. These symptoms can become severe enough to warrant the need for immediate medical treatment and in some cases may result in potentially fatal health effects to the user. Opium addiction doesn’t just happen overnight and recovery won’t happy overnight either. Opium and other opiates stay in the system for up to 48 hours following the last use of the drug and consistent use of opiates can lead to tolerance and dependence. Each time opium is used there is an increased risk of physical dependence and addiction. Even the strongest willed individuals are sometimes unable to refrain from subsequent opiate use once they have begun to develop physical dependence on the drugs. Ultimately, opium addiction can have devastating consequences on the user which include both long term and short term health problems, financial loss and relationship problems. Many of the negative effects of using opiates do not simply vanish when the drugs are no longer being used. It can often take many months or even years to rebuild, regain control and take back the things that are most important in life following an opiate addiction – but help is available! Various methods of treatment have been devised to help those specifically addicted to opium and opium derivatives. For those who have become addicted, opium addiction treatment offers support & hope for recovery even when hope is lost. The method of treatment that works best for your individual needs will differ and may depend on the severity of the addiction, your involvement with a doctor (who may be able to prescribe medications such as methadone or suboxone), your budget and many other factors. Each program uses counseling and therapy as the foundation to help patients heal and recover from addiction to opiates. Inpatient opium addiction treatment is often the first choice for severe cases of opiate addiction whereas cases which are mild to moderate can find benefits in the counseling and support as well as the freedom that is offered by outpatient treatment programs. The treatment that works best for you is likely to consist of a combination of opium detox, counseling, therapy, support & aftercare all of which can be provided either on an inpatient or outpatient basis. If you or someone you love is addicted to opium or opiates such as heroin, morphine or Oxycontin, seeking help early on will lessen the damage that opiate addiction has and can reduce the risk of long term effects.